A renaissance of creativity around developing innovations for energy has emerged in the wake of Silicon Valley’s cleantech bust in the U.S. It’s taken several years to materialize. Bolstered by a series of energy success stories, this newfound creativity has been propped up by increasingly low costs of clean energy technologies and energy storage, and has floated on a change in the political winds. The excitement is evident in the development of new energy incubator projects, new startups, new funding opportunities, new state and federal incentives and new ideas coming out of universities. Silicon Valley still might be hesitant to fund the next generation of energy manufacturing technologies, but a growing number of eager entrepreneurs and investors are coming together to test out new ideas and projects around the world. The energy industry is still a very difficult market to innovate in, and many of these new ideas won’t make a dent in the market. But there’s been a return to optimism, and a willingness to innovate that hasn’t been seen in several years. At the Department of Energy’s ARPA-E Summit last week in Washington, D.C., thousands of researchers, students and business people came together to check out the progress made by the early-stage energy projects the ARPA-E program has funded. They showed off projects like a new type of battery using air, an ultra-energy-efficient compact engine, a next-gen device that can tap into the energy produced by the movement in the ocean, and an ultra-cheap solar tracker made out of plastic and actuators. The 2015 conference was the sixth one I’ve attended. A first for the summit was an ultra-light vehicle that was almost entirely 3D-printed. Arizona startup Local Motors was behind that technology, and the company partnered with the ARPA-E program to launch the LITECAR Challenge, a competition that offers a prize of up to $60,000 to create a lightweight, safe vehicle using 3D printing and new types of manufacturing. Local Motors’ 3D printed car on display at the ARPA-E Summit 2015. During a pitch session on the opening night of the ARPA-E event, startups pitched everything from a “refrigeration battery” and a turbine-free offshore wind technology to a battery made from zinc and a lower-cost fuel cell. The investor judges seemed a little less ruthless than they have been in previous years. To date, the ARPA-E program — which puts small grants into “moonshot” energy technologies — has put over $1 billion into more than 400 projects, and this year announced that 34 of those projects have, collectively, attracted follow-on funding of $850 million. Thirty of the projects have formed new companies, and another 37 have partnered with the government to be developed further. Only “several” were commercialized products. The odds of these projects becoming game-changing commercial companies is pretty small. But that’s just the reality of government funding for basic scientific research. The idea of the program is that, in the way that the U.S. government’s DARPA program sprinkled the seeds of internet and GPS technology, ARPA-E could start the kernels of game-changing energy technologies. These pine wood samples have been metabolically engineered to contain more turpentine, and thus have more energy density when made into biofuels. It’s an ARPA-E backed project from the University of Florida. The program has its enthusiasts and critics. Since it’s not issuing loans or making large investments, it’s not subject to the kind of scrutiny and political backlash that the Department of Energy’s loan program, which backed now bankrupt solar startup Solyndra, has been. The ARPA-E program is unusual in that it tends to get support from both sides of the political aisle. But the program’s annual budget, in the hundreds of millions, is small, so the argument is that it’s not big enough to be effective. And to date, few transformational projects have emerged commercially — though given that the program has only been funded since 2009, and energy technologies can take a long time to mature, the early startups have only had six years of support. Another criticism of the program I heard at this year’s event is that ARPA-E is getting increasingly conservative, trying to back more “tried and true” projects to produce “wins” for the program, instead of maintaining the original spirit of the program — which was to support the really crazy, “out-there” energy ideas. But that’s also a pretty natural progression for a program that’s now several years old and every year needs to justify its existence. Sunfolding, out of Otherlab, makes an inexpensive plastic solar tracker. One of the biggest issues with the ARPA-E program is actually what happens to these projects once they’ve been completed. Most of them have several-year deadlines, and once they’ve run through the grant, it’s unclear exactly where they go, if anywhere. About five years ago, you’d notice many venture capitalists trolling the aisles of ARPA-E looking to pluck out and support some of these projects, but much of that interest has now dried up. But it turns out this space — between government research and commercialized tech — is, itself, seeing some interesting innovation, and two groups — Cyclotron Road and Otherlab — were pretty prominent at the ARPA-E event last week. Some high-cost and extreme energy innovations are made for space. This is a fuel cell shown off by NASA at ARPA-E 2015. Perched just inside the front entrance to the ARPA-E showroom, the energy incubator Cyclotron Road showed off for the first time its cutting-edge energy projects. I wrote about Cyclotron Road when it first launched last summer. It was initially called M37 (referring to what happens in month 37, after the ARPA-E funding runs out). Created by former ARPA-E director Ilan Gur, the idea is to create a sort of incubator–lab hybrid that could support young energy scientist rockstars who also wanted to be entrepreneurs beyond the lab. The first class of Cyclotron Road fellows includes projects based on an ultraporous material that could provide a breakthrough for fuel storage and chemical processing, a new type of wave energy converter, and new efficient materials manufacturing techniques. The fellows get $500,000 over two years, access to Berkeley Lab space, and a network to help them get to the next level. Cyclotron Road is planning to hold another open call for another round of fellows later this year. Volute, an Otherlab company, makes a natural gas tank shaped like an intestine. Then there’s Otherlab, which I covered in detail earlier this month. That’s Saul Griffith’s incubator and it contains quite a few energy projects that received ARPA-E grants, like Sunfolding with its plastic, cheap solar trackers, and Volute, which makes a conformable natural gas tank shaped like an intestine. Otherlab’s recently divulged business model is to spin out some of its projects into proper startups that investors can back. If the spinouts do well, that’s good for Otherlab, which keeps a bit of equity. So these are two new models for getting energy entrepreneurs from early idea to an early company. But don’t count Silicon Valley completely out of this sector just yet. Investor and crystal ball gazer Rob Day predicts that, while investing in “cleantech” will again be flat in 2015, one or more high-profile generalist VCs will jump back into the market with new branding beyond cleantech. Will it be rebranded as “sustainable” investing, “impact” investing, or some other thread on “science technologies that matter”? Who knows. Investor Nancy Pfund getting into her Model S at the Tesla factory on the day of the launch of the Model S.
Science is trendy in the Valley beyond energy. Founders Fund has its “FF Science,” dedicated to science innovations. Lux Capital is still going strong with its materials and science investments. Y Combinator even had an nuclear fusion startup in its group last year. Why is the Valley now experimenting with, and creeping back to fund, innovations for tough energy, transportation and resource problems? One reason is that there have been some high-profile financial success stories in recent years, despite all the hand-wringing and substantial losses. The obvious success story is that of billionaire Elon Musk, who grew Tesla into a public company, shipping tens of thousands of electric cars a year. He’s also the chairman of SolarCity, a now-public solar panel installer, and CEO of SpaceX, which is sending rockets into space regularly. 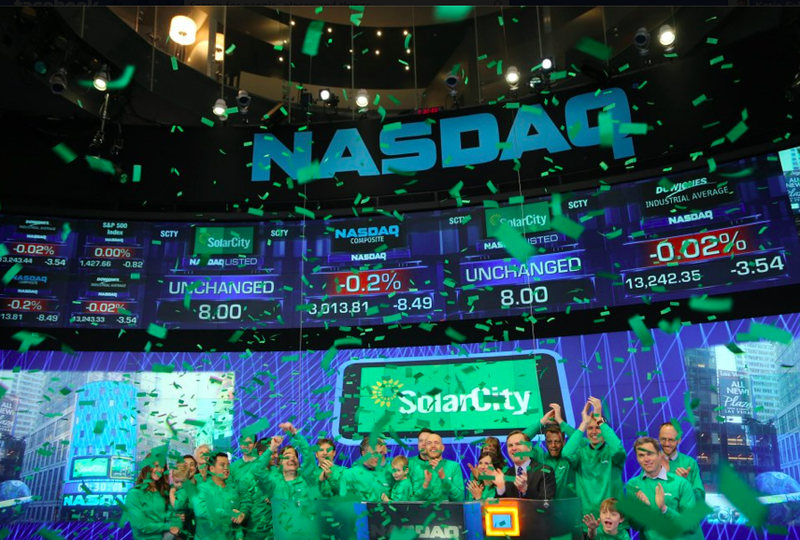 SolarCity going public on the Nasdaq. But there are lesser-known success stories out there, too. Energy software company Opower went public last year and made its founders wealthy, and weather data startup Climate Corp was bought by Monsanto two years ago. SolarCity CEO Lydon Rive, Opower co-founder Alex Laskey, and DBL Investor Managing Partner Nancy Pfund all spoke to the up-and-comers at the ARPA-E conference. Another major reason for the renaissance emerging around energy innovation is that some of the clean power and energy storage technologies are now finally inexpensive enough to be economically viable, increasingly commodities, and can act as a platform for innovation. Low-cost lithium ion batteries paved the way for Tesla and could do so for others like entrepreneur Horace Luke and Gogoro, energy storage services company Advanced Microgrid Solutions, and energy storage startup Stem. Cheap solar panels have created a platform for business model innovations like SolarCity’s solar installation and finance company and new project investment fund Generate Capital. Energy and climate change are hard, important problems that are inspiring the next generation of entrepreneurs. Young founders and employees want to build and work at mission-driven organizations that unite people, and are beginning to care as much about those things as they do about salaries. The best entrepreneurs are those who are passionate about solving hard problems. Cleaner, more efficient, low-cost energy is one of the hardest problems of all. It’s still a lot harder and more time-consuming to make money through energy innovation than it is to make it through, say, a dating or photo-sharing app, but I expect we’ll see a lot more of these new ideas and creativity in the coming years. There’s a renaissance happening here, and it’s time to get into it. The reality is, there’s too much downside to entrepreneur ism right now in America. For most people, it requires that you leave the security of a well paying job, commit all of your family’s financial resources, personally garantee any loans, work very long hours away from your loved ones, convince exceptional people to work for you, fire and replace the ones that aren’t exceptional, create a better “mouse trap” than your competition, and persuade a lot of customers to leave their current vendor. Also, you MUST do all of this at a profit. If you don’t pull it off, you’re pretty much scrued financially, personally, and professionally. Most intelligent people know the odds of success are against you. I’ve heared it said that becoming an entrepreneur requires a momentary laps of sanity. They are correct. I’ve been an entrepreneur for 30 years and know may entrepreneurs. Nearly all of them are standup people who serve their customers, employees, families, charities, and local community. They drive prosparity forward and bring many people with them. They are the job creators. Meanwhile, coal assets are down by about 90% in value. Even more in bulk.